Pasta all’ Amatriciana is a traditional Italian dish that’s usually made with bacon (or pancetta, I’m told, though I have no idea what that is). I’ve never had it the traditional way, but in my less health-oriented days I used to make a vegan version of it with [foodies, close your eyes] Bacos. As anyone who has ever been addicted to Bacos will understand, that recipe was delicious. There’s just something about Bacos…so smoky, so salty, so…. Okay, I’ll quit drooling. Besides being loaded with salt, Bacos are pretty high in fat. 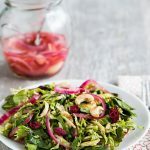 In small amounts as a condiment, they’re fine, but as a main ingredient in a recipe, they’re a nutritional no-no. So I set out to update this family favorite using tempeh instead of Bacos, with limited success. I started out by marinating the tempeh for 15 minutes, but I really think a longer marinating time would improve the taste. Liquid Smoke, which I used to give it a bacony flavor, seems to dissipate during cooking, so I kept adding it while the sauce was simmering. In the instructions below, I say to add it right at the end of the simmering time, to get the full benefit of the smokiness. Did it taste like the Bacos version? Not really. But this smokey tempeh vegan bucatini was good in its own right and similar enough to remind us of an old favorite that we haven’t had in a long time. Tempeh and smoke seasoning replace bacon in this vegan version of the classic Italian dish. Mix the tempeh and marinade ingredients together and set aside to marinate for at least half an hour and up to 24 hours. Heat a non-stick skillet. Add the onion and sauté until it begins to brown, about 5 minutes. Add the tempeh mixture and cook, stirring, for about 3 minutes. Add the tomatoes, chili powder, paprika, and 1/4 cup of the tomato liquid and stir well. Cook over medium heat, stirring often, for about 15 minutes. If it begins to look dried out, add a little more tomato juice. Add the Liquid Smoke or smoked salt and salt to taste. Toss with the pasta and serve sprinkled with vegan parmesan. Makes 6 servings. *Can be made gluten-free if gluten-free soy sauce (tamari) and pasta are used. I just made this last night and it was great! I used tomatoes with chipotle peppers mixed in and skipped all the sauce spices, but still spiced the tempeh marinade. next time I’d probably 1.5X the sauce (not the tempeh) so that it sticks to the bucatini more. Amazing recipes though, thnx! Maple syrup is a nice addition to tempeh bacon as well. I use the recipe from Vegan Vittles and make homemade Bacos with tvp. Good on you for getting rid of the fake meat! As far as I know (from watching the Lfestyle Food Channel) pancetta is a really expensive fancy smoked ham. I don’t know how it would work with tempeh but this worked with tofu. I disolved about 1/2 tsp of Marmite in hot water & added it to my regular soy sauce marinade. Gave it a definite smoky flavor, similar to bacon. Pancetta is Italian bacon. Evil & fat, as in very fat. Those dishes look ABSOLUTELY mouth watering!! I have been pescatarian for the past 10 years or so, since I was 17. I’ve recently become fully vegetarian, but would like to become vegan, however, I love milk to much and it’s hard for me to give it up. Also one of the reasons I have committed to this lifestyle is because of how expensive it seems. Any tips on how to gradually become a vegan will be welcome…. 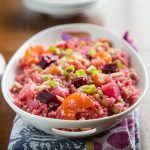 This doesn’t really relate to the recipe, but do you think it’s good to take some dietary fiber everyday (e.g., metamucil)? I don’t particularly enjoy eating raw celery, but I don’t know if manufactured supplements are any better either. well, it may not have been exactly what you were looking for, but it looks quite yummy and comforting – perfect for this chilly weather. 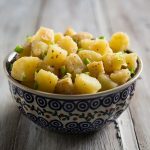 This is a really great recipe for vegan “bacon bits” from an old Vegetarian Times Redux recipe for German Potato salad. 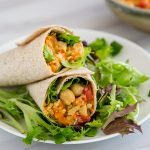 The author also used tempeh at first but found TVP work better. I made some minor changes as I wasn’t interested the salad part. First, I mixed the “flavouring” part with the TVP then added about 1 to 1 1/2 tbsp less water called for and covered the bowl with a lid. After rehydrating, I spread the “bacon” mixture on the small baking sheet from my toaster oven. Bake the mixture at 350F and occasionally stirring the mixture until desired dryness. Since, I don’t usually have maple syrup I used about 1 tsp of sucranat instead of maple syrup. Sorry, that was alittle too long-winded and this is the address for the recipe. This is what I would define a… culinary murder! Amatriciana with vegetable broth, soy sauce, bacos, … Oh poor me! I'm Italian, from Rome, and I'm a professional cook. Sometimes, I also like revisiting traditional recipes. But there are some milestone recipes, in the Italian tradition, which you simply can't change. You start this article affirming you have never tasted the real traditional "Bucatini all'Amatriciana", and I can clearly see it reading your recipe. First of all, I want to clarify that the real Amatriciana is made not with "pancetta", but with "guanciale", which is a tender meat from the pig's cheek area. According to the traditional, original recipe, you won't use any oil, neither garlic or onions. 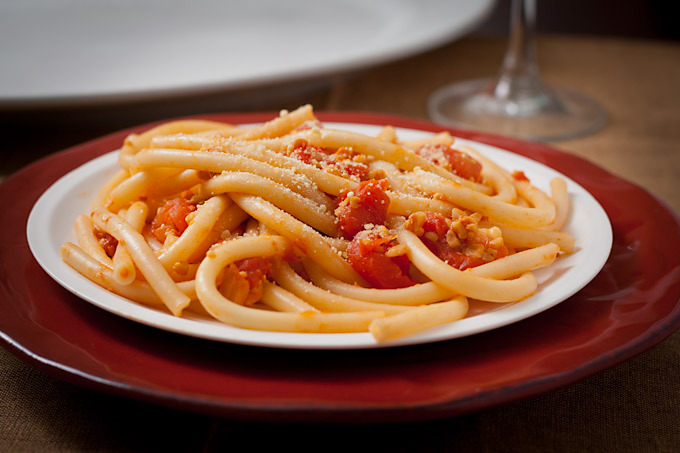 The only ingredients you will need are "guanciale", fresh tomatoes, red pepper, "bucatini" and romano cheese. That's all. You are you most welcome to promote Italian cuisine all over the word, even if revisited. 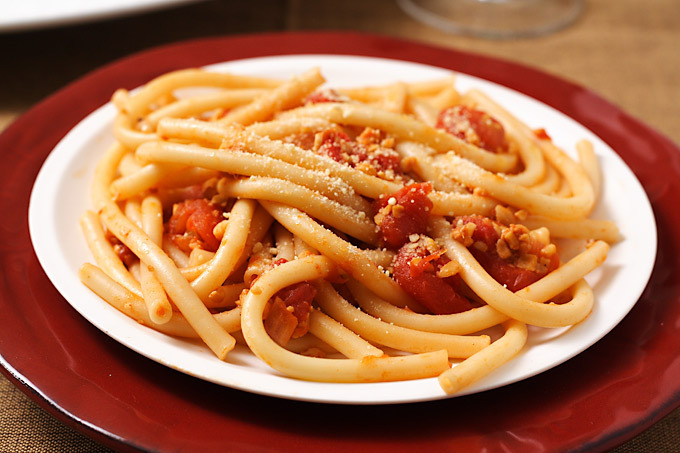 But please, oh please: this one you are providing is not "Bucatini all'Amatriciana" recipe. 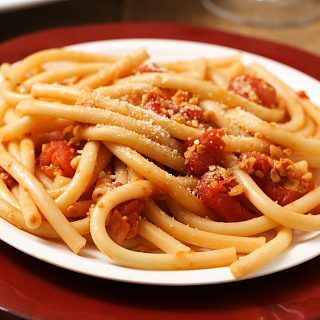 And since this article is one of the first results Google shows when you search for "Bucatini Amatriciana" in English, people may have a twisted idea of what original "Bucatini all'Amatriciana" recipe is. So please, give your recipe a more suitable name (Bacos Bucatini? Fake Amatriciana?). Thank you! I could understand the person above being frustrated with the search bringing her here, but wouldn’t you be able to see that this is a VEGAN website? No meat, no dairy, no animal products of any kind 🙂 I can agree with changing the name but I don’t see what’s so fake about it, I’d just call it “Vegan Bucatini all’Amatriciana” And by the way it look yummy! Personally, I’m inclined, as an animal rights person, to say that, if people try this version and are happy with it, that’s awesome, and if people are misled and “miss out” on versions that involve animal products, that’s a bonus. You’ll not get me or any other vegan who cares about animal rights to feel too sorry about people missing out on more traditional versions of dishes when these require cruelty to animals. This sounds wonderful! I think I will make it this weekend. Do you think if I use the Fakin Bakin Tempeh I could skip the soaking step? I assume you are using plain tempeh and soaking to give it a bacon flavor? Yes, you could use Fakin Bacon and skip the marinating, but that eggplant bacon sounds like a great idea. this looks good, however i always think that things have got a specific name for a reason, so this is definitely NOT bucatini all’amatriciana and the title should be changed into something different, as it is it is deceiving and people who might travel to Italy might order something that is totally not vegan at all. Is really like naming a Bolognese sauce that is made with soya mince. That as well would not be called Bolognese sauce. The Chew today reminded me of this post. I had to look it up. Surprised it was from ’06. Hat’s off to my memory then. We love bucatini and our version uses chipotle and smoked paprika w/ Bourbon soaked oak & chamomile smoked tofu ‘pancetta’ bites. YUM! looks good. Oh please tell me what the bacos version is!!! Instead of making the tempeh, just add a half cup of Bacos to the tomatoes, adding a little water if it seems too dry. Warning: Bacos contain a lot of sodium!